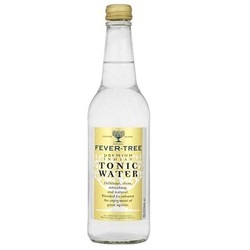 By blending fabulous botanical oils with spring water and the highest quality quinine from the fever tree, we have created a delicious, natural tonic with a uniquely clean and refreshing taste and aroma. Winner of San Sebastian Gourmet Awards, 2006. TASTING NOTES:Colour - pure and crystal clearAroma - clean and fresh with citrus and aromatic hintFlavour - Very soft. Subtle and supportive citrus and fruit notes balanced by bitterness of natural quinine. The finish is clean with none of the usual cloying mouth feel of other tonicsTexture - high carbonation delivers the aromas and taste in a classic refreshing styleIngredients - Spring Water, Cane Sugar, Citric Acid, Natural Flavours, Natural Quinine.Nutrition Facts - (Typical Values per 100ml): Energy: 160KJ, 38 kcal; Protein: 0g; Total Carb: 9.0g of which sugars: 9.0g; Fat: 0g of which saturates: 0g; Fibre: 0g; Sodium: trace mg.